Jorge Castillo: Plantains are a staple in the Cuban diet. We use them in many different dishes, but you most frequently see them served as maduros (fried sweet plantain) and tostones. 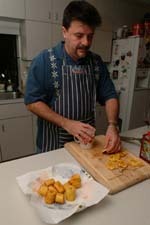 Glenn Lindgren: Tostones are unique because they are fried twice. 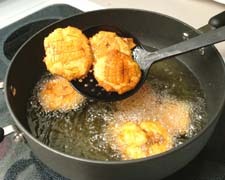 This double frying technique is very popular in Cuba! 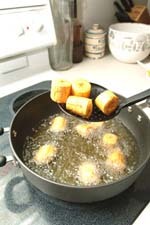 Many cooks use this technique to make French fried potatoes and boniato (sweet potatoes). Many of the French fries served at State fairs and carnivals in the U. S. are now made using this method. The frying, NOT the smashing part! Raúl Musibay: The tradition of the tostone comes from African slaves. In the Congo, the people prepare plantains in the exact same way, even to this day. Glenn Lindgren: Some purists insist on a completely starchy tostone with no sweetness. For them, only a perfectly green plantain will do. Raúl Musibay: They must be green, green, green! That's the only way. Glenn Lindgren: Others like a little sweetness in the tostones, and a plantain with a few speckles of black makes a sweeter version. I actually like them this way, although Raúl may never forgive me! Many of the tostones you get in restaurants today are more on the sweet side. 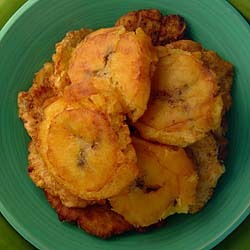 In fact, many places are serving the sweeter Hawaiian plantains (plátanos hawaianos) made into tostones. Jorge Castillo: You'll know you're eating a Hawaiian plantain tostone by the size -- they are lot larger. We also know that many restaurants are now using pre-cooked Hawaiian tostones. Glenn Lindgren: We've eaten them many times and surprise -- they are very good! Tostones are unique because they are fried twice. Peel the plantain: Cut the ends of each plantain off with a sharp knife. Use the knife to cut through the peel only the entire lenth of the plantain. Loosen the peel along the cut and remove peel by hand. 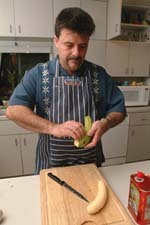 Cut the plantain into slices, about 2 to 2 1/2-inches wide. Fill a large skillet a third full with oil and heat over medium-high heat to a temperature of about 300 degrees F. Once the oil is hot, fry the plantain slices for approximately 3 to 5 minutes, turning once, just long enough to make them soft. Remove the plantains and drain on paper towels. Use a plantain press or a brown paper bag folded over to smash the plantains to about half their thickness. Let the oil come back to a higher temperature -- this time about 375 degrees F. Fry once again, turning occasionally, until golden brown on both sides. Remove and use paper towels to absorb excess oil. Sprinkle with plenty of salt and serve. All iCuban photos on this page by Nancy Bundt.